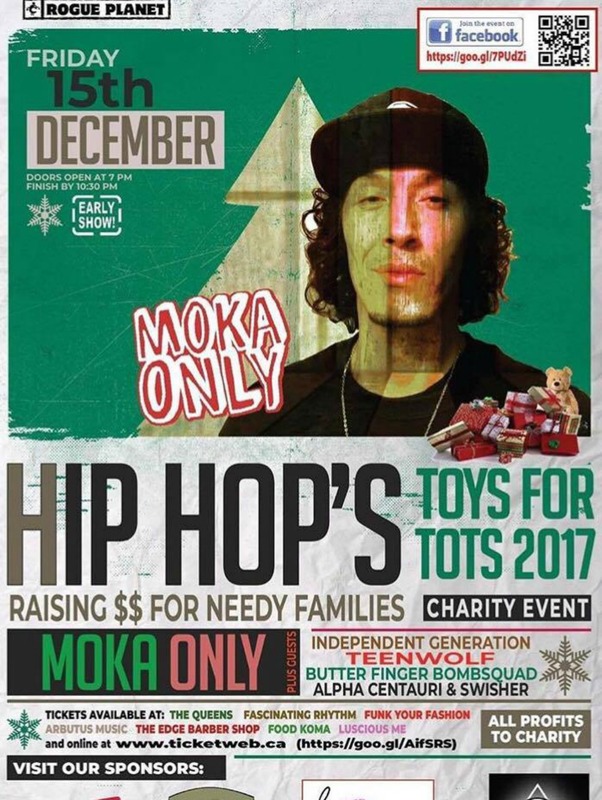 Moka Only – Toys For Tots 2017 Charity Concert – Nanaimo, December 15, 2017 – ASHLAR LODGE, No.3, A.F.& A.M.
Vancouver based hip hop musician Moka Only, a Freemason (he is a member of a Lodge in Vancouver), is headlining Hip Hop’s Toys For Charity 2017, a charity concert to raise funds to help needy families at Christmas. This concert will be held on 15 December 2017 at the Queens Hotel, 34 Victoria Crescent, in downtown Nanaimo. Doors open at 7:00 p.m. The Queens Hotel is only a few blocks from the Ashlar Masonic Temple, 101 Commercial Street, Nanaimo. Tickets are available at Fascinating Rhythm, half a block west of Ashlar Masonic Temple. We encourage all interested Freemasons to attend and support our Masonic Brother Moka Only in this charitable event.